It’s always amusing when I bring cake or other goodies into work or school and I watch people attract to it like a swarm of bees. Buzzing around getting their sugar fix and asking how I made it. I was once carrying around some cake to class and someone stopped me and asked about it. Well I shared some slices with him and a friend and as he ran away with his ‘dinner’ he yelled back to me “Thanks Sugar Fairy! !” (new favorite nickname) Well, this happened again yesterday since we had our monthly staff meeting and I brought in Muddy Buddies. Not familiar with Muddy Buddies? 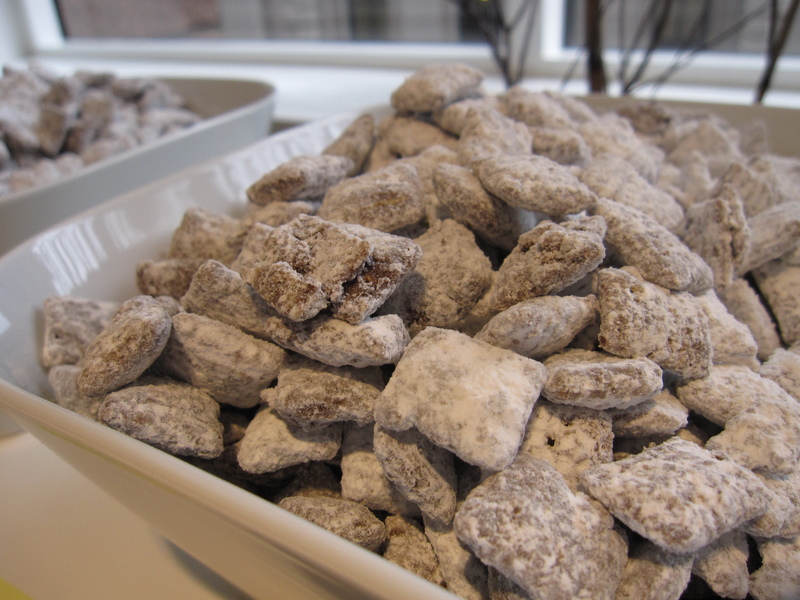 Maybe you’ve heard of Puppy Chow? Still no? Well, imagine a simple piece of Chex cereal becoming host to a chocolate, peanut butter, and butter mixture, and then covered in powered sugar. This simple had just taking a drastic turn into the realm of high addictive pop in your mouth foods. Simple to make with just a few ingredients. Some melting, stirring and then shaking. Plus if you do it right (not like me) you won’t have many dishes involved in there. A bowl for melting, a big bowl for mixing, a spoon for mixing. Use a BIG ziploc bag and things are really easy then. If you are making a few batches, or like me using 3 boxes of Chex cereal, then be prepared with a few ziploc baggies. Trust me, it makes it a lot easier to use a few than try to resue them a few times. The recipe said to let the Chex cool down after the bounce in the bag but I felt that mine was not too hot and did not need to be laid out on a parchment paper coated cookie sheet. 1) In a large bowl, measure cereal, set aside. 2) In a microwave safe bowl, put the chocolate, peanut butter, and butter together. Microwave on High for 1 minute. Stir mixture. Continue to microwave and stir in 30 second intervals until the mixture is smooth. Add the vanilla extract. 3) Evenly pour the mixture of the Chex cereal and mix together until cereal is evenly covered. 4) Transfer to a large (2 gal) resealable plastic bag. Add the powdered sugar, seal, and gently shake until covered. 5) Store in an airtight container in the fridge or freezer. I have a similar receipe (I guess everyone does) but it is called “White Trash”. I enclosed it just in case you want a little varity. Mix cereal, raisins, and nuts in a large bowl. Over a low heat melt butter, peanut butter and chocolate. Let cool, pour over cereal mixture, covering all items well. After cooling, place covered mixture in a large paper bag. the mixture has a white coating. Place mixture in an air tight container.